On December 28th, the #2 ranked heavyweight will know his next fight. UFC heavyweight champion Cain Velasquez will miss the biggest part of 2014 due to surgery he’s having to repair an injured shoulder, so the contenders in the division will move on without him. The first order of business is getting Fabricio Werdum back in action because he was originally scheduled to face Velasquez in early 2014, but with the champion sidelined for several months the bout has been postponed. Despite expressing some interest in waiting for Velasquez to return, the UFC will put Werdum in a fight against another top heavyweight following the conclusion of UFC 168 later this month. "I met with (Fabricio) Werdum yesterday or the day before – he’s going to fight the winner of Travis Browne and Josh Barnett," UFC president Dana White told FOX Sports on Thursday. "Waiting is ridiculous." I’m not interested in him waiting, he’s going to fight. "I’m not interested in him waiting, he’s going to fight. Because it gets to a point where it’s been so long since he fought nobody gives a s—t. You start to disappear and nobody cares and they start talking about other heavyweights and it’s like ‘why is this guy getting a shot when he hasn’t even fought?’ so we’re going to push him to fight." 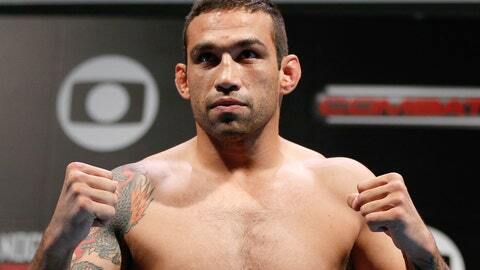 Werdum last fought in June when he submitted Antonio Rogerio Nogueira to earn the top spot as the No. 1 contender, but he was already in line behind former champion Junior Dos Santos who was already lined up to face Velasquez at the time. Now with Velasquez out for several months, Werdum will jump back into the contender’s race against the winner of Barnett and Brown. The winner of that fight, assuming timing works out with the championâs surgery and recovery time, will then face off with Velasquez. "Exactly," White said about that scenario playing out.